I heard about this yesterday and didn't think to try downloading it until last night. 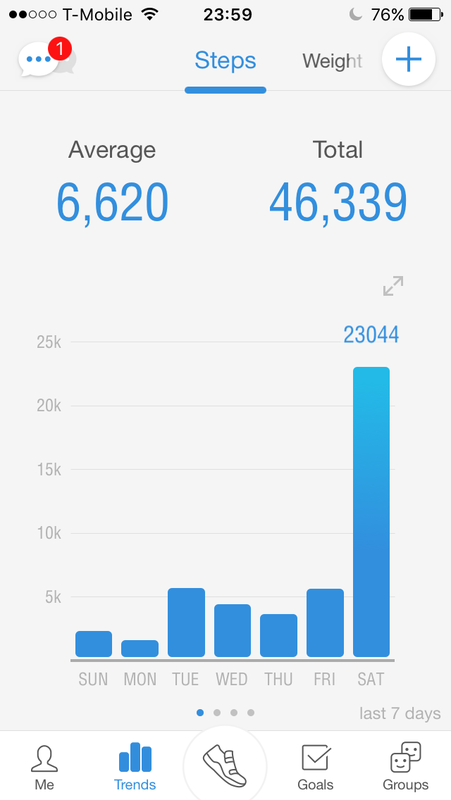 Anyway it's definitely boosting my step count, but so did Ingress. Which team you going with? I went with red, but I'm quickly regretting it. Seems there are a bunch of reds already owning all the local gyms, and IIUC it's easier to take on a gym that's an opposing team. You get to use 6 instead of 1 pokémon then, is that right? edit: After much more reading, I clearly misunderstood how the gyms were supposed to work. Chock that up to there being no good in-game explanation. The app is unstable as hell, and it's incredibly frustrating. I can't tell how much is the app's fault versus the overloaded servers' fault, but when I went for a walk this morning (~10 AM EDT) the app crashed so often I only successfully kept about 1/3 of the pokémon I should have caught. If I had a freeze/crash counter, it would probably be nearing a hundred today. The UI is definitely weird. I'm disappointed that there are no decent good instructions for how to actually do anything. I find myself browsing subreddits with FAQs to piece it all together, and I still don't know why the heck I keep losing so quickly at the gym to a rival who is weaker or roughly equal to my specs. It's an unbelievable drain on the battery. If I didn't have a portable external battery, I would never realistically be able to play it. I'm playing on an old 5S and the general performance (ignoring the battery drain and constant freezes/crashing) is pretty smooth. Honestly, I'd rate it 2/5 stars today. I hope the devs are furiously trying to address the stability and server overload issues. I'm persistently pushing through because I really like the idea and novelty (I've know about but never gotten hooked on AR games) even though the implementation is borderline hostile. On the bright side, this definitely seems to be getting people outside and active. The silly anecdotes I've read online aren't isolated incidents, and I have my own to add to the list. This afternoon, I ran into and spoke with three adults (and saw several kids) walking around my town's downtown area, all hunting for pokémon and pokéstop loot. One of the adults had just come from a group of ten more who were camping in a nearby café (and drinking beer) that has a pokéstop. So mind giving me a concept of what you actually do with this game? After reading about a girl finding a body in a river and seeing this hilarious video about what people are like when playing the game. The fact that it makes you more active and walking around seems like it might be worth it to at least try. 1. Keep an open mind! 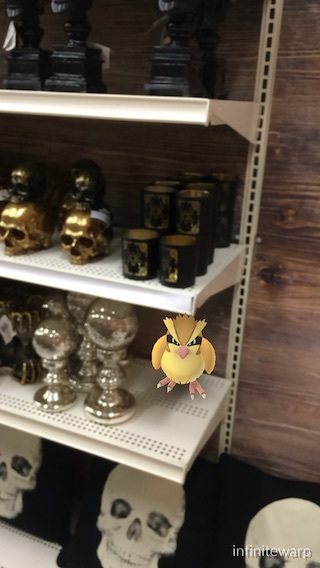 You never know where a rare Pokémon might be hiding. Don’t be afraid to explore new areas of your town—adventure is what it’s all about! 2. Charge your phone. There’s nothing worse than getting ready to snag a rare critter only to have to have your screen go dark. 3. Buy several additional phones. This way, when one phone dies, just throw it away and turn on another. Dead weight only slows you down. 4. See if you can get a neighborhood kid to play with you. He’ll no doubt have some sick tips, and his mom’s been pretty busy since Mitch started coming around. 5. Don’t forget—kids need snacks! But he’s allergic to tree nuts, and try to stay away from refined sugar. 6. Don’t bring up how the world of Pokémon is actually pretty grim if you really think about it. Buncha kids keeping wild animals in golf balls and forcing them to kill each other for sport. It’s not right. 7. You know. You’d think that at least one Pokémon has to have died while inside their ball at some point. 8. Just imagine it. Ball opens. Squirtle rolls out. Your opponent averts his gaze and pretends to clear his throat as you frantically try to push Squirtle back into its deathbed but you accidentally put him into Pikachu’s ball and now Pikachu is never going to be the same. 9. Where do they bury the Pokémon remains? I suspect you and the lady Ts would love it. My wife has had a blast with it (when it works), and she's never played a pokémon game in her life (though she has seen bits of the TV show and is familiar enough with the concepts and popular characters). However! You should probably wait until next weekend with the hopes that they will have straightened out some of the problems by then. Right now it's an infuriatingly broken mess due to its popularity and inability to keep up. You are a pokémon trainer! Your job is (surprise) to catch and train pokémon. You find pokémon by walking around in the real world; this is an augmented-reality game that uses the GPS, gyroscope, and (optionally) outward-facing camera to put you in the game. Pokémon appear pseudo-randomly (more frequent in some types of areas than others), and when you encounter one, the screen goes from a Maps.app-like overhead view to a camera-perspective view with the pokémon somewhere near you. You throw pokéballs, and if you time one right and are lucky, you catch the pokémon and carry her with you. Unlike the Game Boy/DS series, there's no fighting with random encounters. Instead, you just try to catch them without wearing them down first. Instead of fighting random encounters to level up your pokémon, you "transfer" (read: sell) your extra pokémon back to the game for points you can use to level up the ones you've kept. It's a free-to-play game with in-game purchases for extra pokéballs and other items. If you walk around parks, libraries, churches, schools, and other public facilities, you'll very likely find a "pokéstop" which is a persistent totem that you can touch to get extra balls and stuff without having to buy them. They have about a 5 minute cool-off before they refill and you can take items out again. They are only limited per-person, not globally. So, if you and I are standing at the same one, we can both take items at the same time. 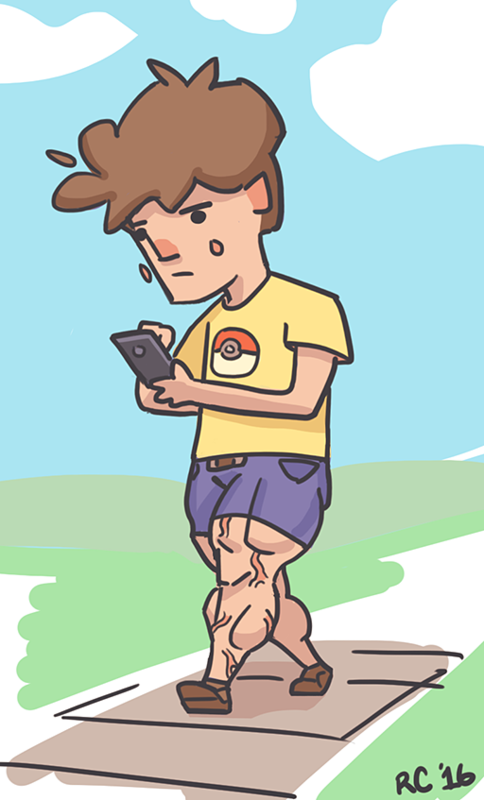 Once you start collecting and leveling up your pokémon, you can go to a gym to asynchronously challenge other players. The first one there gets to claim the gym and leave a pokémon behind. If a challenger defeats the pokémon in the gym, she gets to claim it for herself and leave one of hers behind. Rather than "every man for himself" there are three teams everyone joins: red, yellow, and blue. This adds another dynamic to the gym stuff, but I won't get into those details here because I haven't mastered that yet. This is what the overhead view looks like when you're walking around. You can pinch-zoom and rotate around. That big floaty tower thing is a gym. Like the pokéstops, gyms are persistent at notable locations like churches, parks, etc; that one is at a nearby neighborhood church. I have to be standing in the parking spaces nearest the building to be considered "close enough" to interact with it. Those smaller floating blue things are the pokéstops that you can visit for free items. There are lots of those things in places around our public parks. There were I think 8 or 10 cars (maybe fewer if they looped around, maybe more I didn't notice) who were driving to the nearby pokéstops, pulling to the side of the road for a moment to get the items from inside their car, and then continuing on to the next nearby stop maybe 100 feet away. You could tell because they stopped at EXACTLY the right places, and the driver or passenger had their phone lighting up their face. DUDE. For all the gasoline you're wasting putting around town, just buy the frikkin' items! Oh, and I updated the first post with an end-of-day screenshot for maximum wtf-factor. That roughly works out to 12 miles and 950 calories burned. If you ever wanted an addiction that gets you some extra cardio, this is it. Wow, that is just amazing. I wonder what it's like in my town. I can only imagine the people on foot or bike. So now you need to keep your sidearm handy when playing! <- Gizmodo link, sorry. 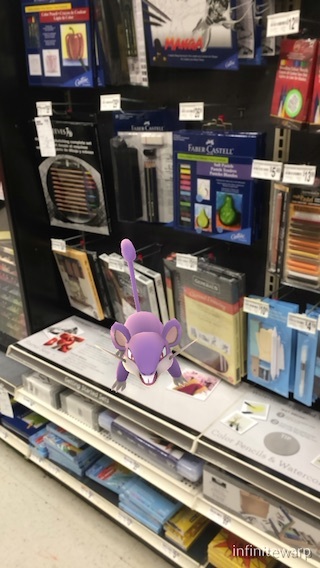 The new augmented reality game Pokemon Go has gotten people off the couch and into the real world. But police in O’Fallon, Missouri say that four men have used the game to find players at a specific location, and robbed them using a handgun. About eight or nine people have been robbed by four men over the past couple days, a spokesperson from the O’Fallon Police Department told Gizmodo over the phone. The latest robbery occurred Sunday morning at around 2am by the men in a black BMW before they were finally apprehended by police. The suspects used the Pokemon Go game to find their victims by anticipating where people might go through popular PokeStops—virtual sites in the game that can be designated at any real word location, from businesses to parking lots to churches. The four men apprehended all range in age from 16 to 18. Their names and what they stole from their victims have not been released. The O’Fallon Police Department advises that if you’re going to let your kids play Pokemon Go, make sure you keep an eye on where they’re hanging out. 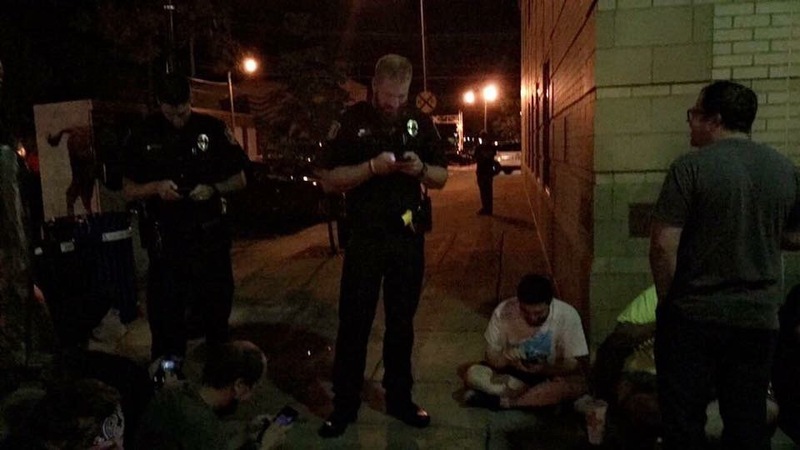 The local cops were probably too busy playing Pokémon Go themselves. My wife and I were just talking about the safety/crime potential aspects of this last night as we were walking around our downtown. One one hand, you have more people walking around town absorbed by their phone. Are they more likely to be involved in or cause an accident? Are they more likely to be victims of muggings and other crime? On the other hand, you have more people walking around town putting more eyes and feet out there as local citizens. Are they more likely to affect the social climate in a positive way? Are they more likely to start friendly interactions that wouldn't have triggered otherwise? No doubt it's a mix of both, but from what I've seen so far, it's been overwhelmingly the latter. Right now the game is getting a ton of traffic and publicity, and the newness will wear off for a lot of people soon enough. I suspect that in a few months, it will probably fall into a smaller niche of rotating dedicated players, and whatever effects we're seeing will fall off with it. Meanwhile, it's still a lot of fun finding these little pocket monsters wherever you go. So, I downloaded the game and "started" playing. I'm not on a team yet and only have one capture. I haven't gone walking for them or anything either. For some reason my Pokemon all ended up at the very top edge of my screen and that made it hard to try to catch them. I saw a second one but wasn't able to catch it. Oh well. I'll poke at it a little more. Trying to convince Mrs T to stop worrying about me being mugged while playing has been fun. I told her about the story I shared and now she figures half the people playing are criminals. Sure I'm over exaggerating, but she cares about me so I don't mind that much. It's already the new Craigslist / Facebook rolled into one titanic mess! 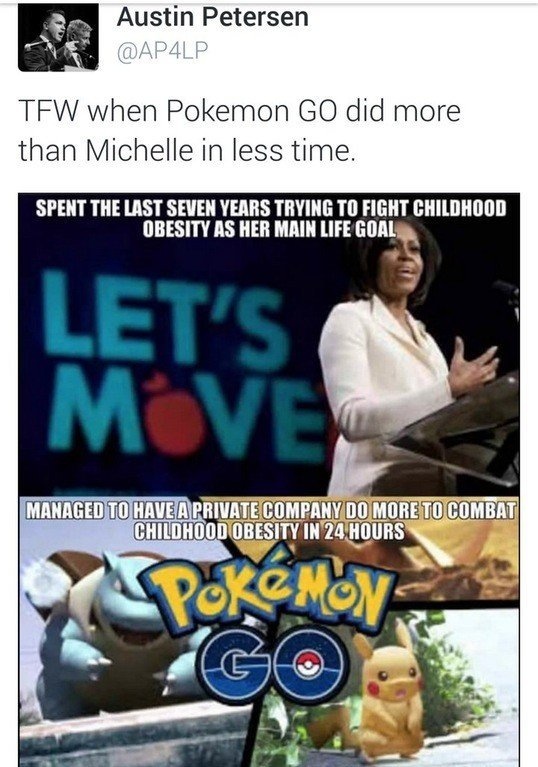 Death by Pokémon Go is a real issue. Can you play this with the phone in your pocket or does it have to be out and in your hand as you're walking? I'm going to have 2.5 hours to kill here shortly and figure I can walk around the city I'll be in while I'm doing this. I figure it will keep me active instead of sitting in my vehicle while I'm waiting... I just don't want to hold my phone out while I'm out walking. Unfortunately, the app has to be fully active to track anything. That means if has to be the foreground app and the screen has to be on, not locked. There's a "battery saver" mode that uses the gyroscope to attempt to detect if it's tilted down. When that works, it stops the 3d rendering and just shows a black screen with a logo. It helps the battery a bit, but the constant GPS and server pings are still a serious drain. Also, you still have to touch it every few seconds to keep the phone from just going to sleep. And there's a bug where the app stops responding to input when it "wakes up" from that mode. Oh, and sometimes it gets the gyroscope backwards and you have to hold the phone upside down to access anything. It's still a hot mess. Well I can say I'm having even more bugs with my game since there are a few bugs with the gyroscope/orientation in iOS 10 beta. So I ended up having to turn off AR for now. This seems to make it easier for me though. I'm still one level 4 after playing it for over two hours today. I currently have 12,342 steps today. Yes, most is from the game play. The really sad part of that... is that I walked for almost a full hour at the oceanfront and looked at tons of Pokestops but didn't swipe to collect anything. I missed that part of the training that said how to get stuff from them. Thankfully by the time I walked around Norfolk this evening I was more aware of the rules and actually collected hundreds of pokeballs and eggs and such. A couple of times I have caught a Pokemon and the game just kind of froze without telling me I got the Pokemon. I closed out the app and opened it back up and my little dude was captured. I've started using my battery pack case when walking around this evening and it worked great. It was near dead while my phone was at 100%. Get used to those freezes when trying to catch a pokémon! That's a stupidly common bug (largely due to the overloaded servers failing to respond in a timely manner), and the only resolution is to force quit the app, relauch, and hope for the best. Sometimes you win; sometimes you lose. And don't think you missed some instruction about the pokéstops. You didn't. The built-in tutorial is garbage. Same thing surely goes for us big kids. There's been a scare piece going around that Pokemon Go granted the app maker super deep access into your personal data, but believe that was discounted by this article on Gizmodo. Anyone here willing to do a quick and dirty write up of how to play? I have three children under the age of 9, step 6 doesn't exist in my life. I was wondering myself (never Pokemon'd in my life) and found this Verge writeup helpful. Might try it out this weekend. Scroll up? I think I covered the most basic basics. 1. Walk around with your phone out and the game on. 2. Random encounters give you opportunity to catch pokémon in an augmented-reality mode using your camera and gyroscope! 3. Visit persistent "pokéstop" landmarks to get loot (more pokéballs and items to lure pokémon). 4. 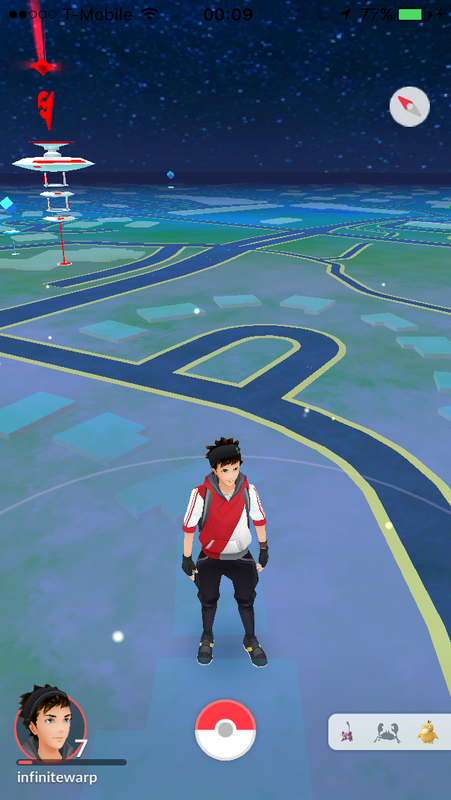 Visit other persistent "gym" landmarks that let players compete for temporary control. Controlling a gym for ~21 hours gives you in-game currency that you otherwise have to pay real moneys for. Yes, the Google auth granted *full* access to your Google account, but this was an obvious mistake, and it's already been fixed in the minor release that went out today. So I managed to get myself to level 7 today and fought and lost in a gym twice. I now have one of my highest guys in a gym helping to defend it. I tried to add a second guy to a gym nearer to my house but it only gave me the option of training in the gym. Oh well. I'm really enjoying the game and now my kids are interested. They don't have GPS on their devices so they are going to have to wait it out.